Colloid cysts represent about 1% of intracranial tumors and about 15% of intraventricular tumors. The first surgical treatment of a colloid cyst was performed by Dandy in 1920, and since then, many studies have addressed the surgical treatment of this pathology. Open surgical approaches, discussed in 22.2, for intraventricular colloid cysts, are still regarded as the gold standard because they ensure complete resection and a low recurrence rate. The two most commonly used ventricular approaches used for excision include the transcortical and interhemispheric transcallosal approach. The transcortical approach is easy and straightforward, however, requires cortical division with a risk of seizure. The interhemispheric approach is recently favored because of its less invasive nature; however, it is complex with a risk of cortical venous infarction. Most of the lesions are amenable for complete excision through a dilated foramen of Monro. In difficult or large lesions, the third ventricle can be opened through a multitude of approaches that include the transforaminal, interfornicial, or subchoroidal routes. A complete excision ensures long-term cure, and the main goal of surgery is the avoidance of surgical complications. In recent years, the microsurgical approach has been considered the standard gold. Nevertheless, in the last two decades, many authors have reported the advantages of a transventricular endoscopic approach, discussed in 22.3, which include less invasiveness, less risk of seizures, as well as shorter operating time and hospitalization. 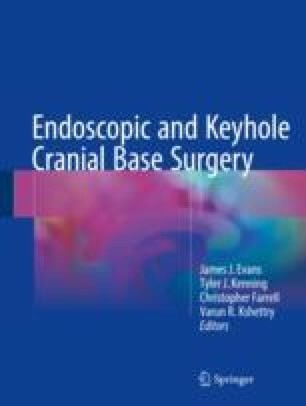 In addition, with the advancement of endoscopic equipment and the learning curve of endoscopic techniques, high degree of complete resection with low recurrence rates is being reported.